IMG_1031, originally uploaded by Trevor_MTB. This great Kauri tree (Agathis australis) is reported to be the largest tree in New Zealand. It goes by the name "Tane Mahuta" which I believe means "God of the Forest" in the Maori language. 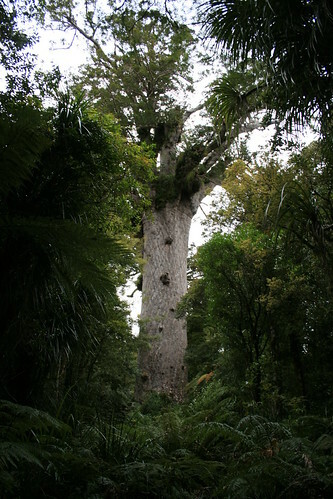 The second largest tree in New Zealand is nearby and is called "Te Matua Ngahere" which means "Father of the Forest". Hi Dan, this Kauri would be my favourite NZ tree, the Waipoua forest where it and the other large Kauri are, is the most beautiful place on earth. Have you visited NZ ? I have not visited New Zealand. It is very high on my list of places I would like to visit though. And if I did go there I think this forest would be one of the first places I would go to. You should definitely make the trip to New Zealand. No one regrets it! Make it a long trip and see as much as you can!